Columbia County is a county located in the state of Wisconsin. Based on the 2010 census, the population was 56,833. Its county seat and largest city is Portage. The county was created in 1846. At the time, it was in the Wisconsin Territory. 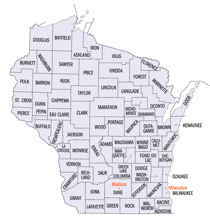 Columbia County is part of the Madison, WI Metropolitan Statistical Area as well as the Madison-Janesville-Beloit, WI Combined Statistical Area. Columbia (originally Portage; see Portage, post.) County - probably named in honor of Christopher Columbus. 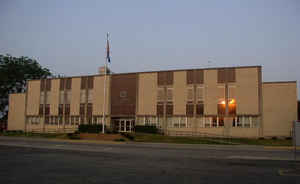 Wis. Hist. Colls., i, p. 112. Gannett, Place Names, p. 79, appears to indicate that the name was taken from Columbia River. It was more probably given because of the town of Columbus, which was first established as Columbus precinct in 1842, and was the first county-seat of Columbia County. See A. J. Turner, Family Tree of Columbia County (Portage, 1904). "COLUMBIA, County, is bounded on the north by Adams and Marquette, on the east by Dodge, on the south by Dane, and on the west by Sauk; and is located mostly in the vicinity of the Portage of the Fox and Wisconsin rivers. It was set off from Portage and organized February 3, 1846. The streams of this county are: the Fox, (Neenah), Wisconsin, and Crawfish rivers, and Rocky Run, Ockie, Spring, and Duck creeks. For fertility of soil and feasibility of lands, the most of which are openings and prairie, this county is unsurpassed by any other in the State. The towns of Winnebago, Port Hope, Marcellon, Scott, Randolph, Portage, Prairie, Spring Vale, and Wyocena, forming the first; and the towns of Columbus, Fountain Prairie, Hampden, Otsego, Leeds, Lowville, Lodi, Dekorra, Westpoint, and Caledonia, the second district. The vote of the electors at the annual town meeting in April, 1851, permanently located the seat of justice at Fort Winnebago... The population in 1846 was 1,969; 1847, 3,791; 1850, 9,565. Farms, 998; manufactories, 25; dwellings, 1,855." Population in 1850, 9,565; in 1855, 17960; increase 8,395. The County is nearly in the centre of the present settled portion of the State, and lies on both the Wisconsin and Fox Rivers, which approach within two miles of each other at Portage City--the former a rapid, changeful current, subject to sudden rises, flowing between high banks and over falls; the latter sluggish and unchanging, with marshy banks, or spreading itself into doubtful lakes, and navigable with little water. The land of the whole of this country is good, the surface diversified with rolling prairies and burr oak openings. There is little timber growing in this County, but the want of it is well supplies by the Wisconsin pineries, the timber from which is floated down the Wisconsin River to and past this county. Few counties in the State have increased within the past five years with the rapidly of this. All north of the Fox River, then known as Indian lands, is now well filled with people. There is consequently little good Government land to be had--in truth, it was nearly all taken as soon as brought into market. Portage City, on the Wisconsin and Fox, here connected by a canal, is the county seat, and one of the most prosperous and busy towns of the State. The Wisconsin is navigated up to this place. It contains a bank, two weekly papers are published there, and it commands the trade of a large country, especially that lying up the Wisconsin River. Columbus, on the Catfish, contains a population of about 1,000, and is a busy, thriving place. The La Crosse and Milwaukee, and the Milwaukee and Watertown Rail Roads are both to pass through this County, and will soon reach it. The Wisconsin Central Road has its terminus at Portage, connecting it with Chicago direct. As reported by the Census Bureau, the county has a total area of 796 square miles (2,061 km2), of which, 774 square miles (2,004 km2) of it is land and 22 square miles (57 km2) of it (2.75%) is water.